Agricultural Officer (Extension) in Tamil Nadu Agricultural Extension Service - 192 Posts - Basic Pay 9300 Grade Pay 5100 plus allowances in Pay Band II category (Basic Pay 37700 plus allowances in Tamil Nadu State Pay Matrix Level 20) - Bachelor's Degree in Agriculture. 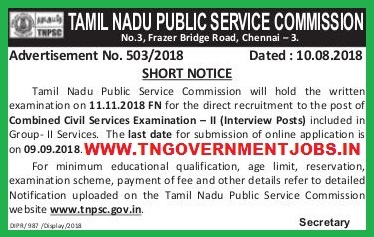 Click the link, enter your Log in ID or Application ID with your Date of birth to download the TNPSC Group 2 Exam 2018 Hall Ticket. How to find easily [press Control Key + F key] and enter your ROLL NUMBER then press Enter Key.